← Is this the end for Google+? LOVE it or loathe it, Disney knows how to sell an experience and when they’ve got you captive, they immerse you in that experience. From the moment you walk into that theme park/store you’re transported to a different world where the excited cries of children mix with those of more than a few adults too. 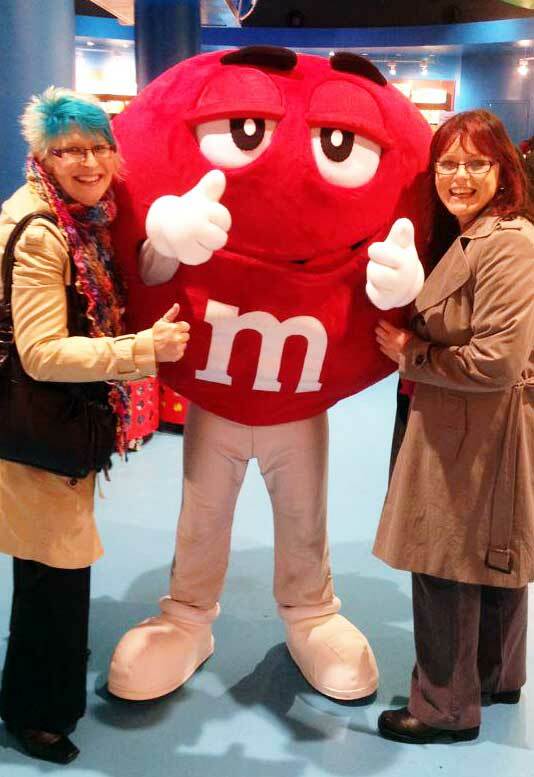 Although feeling a little over dressed for the occasion, we found ourselves totally immersed in M&M’s World… and they’ve really taken a leaf or 50 out of Disney’s book! Britannia welcomes us to M&M’s World. 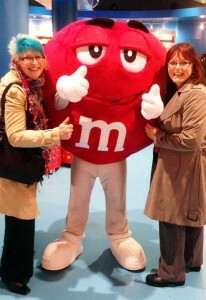 With the alluring waft of chocolate being pumped out into the crowded aisles we were soon caught up in the M&M’s experience. It’s amazing what merchandise you can create on a chocolate theme – from limited edition figures to an M and M Swarovski crystal encrusted denim jacket costing thousands. 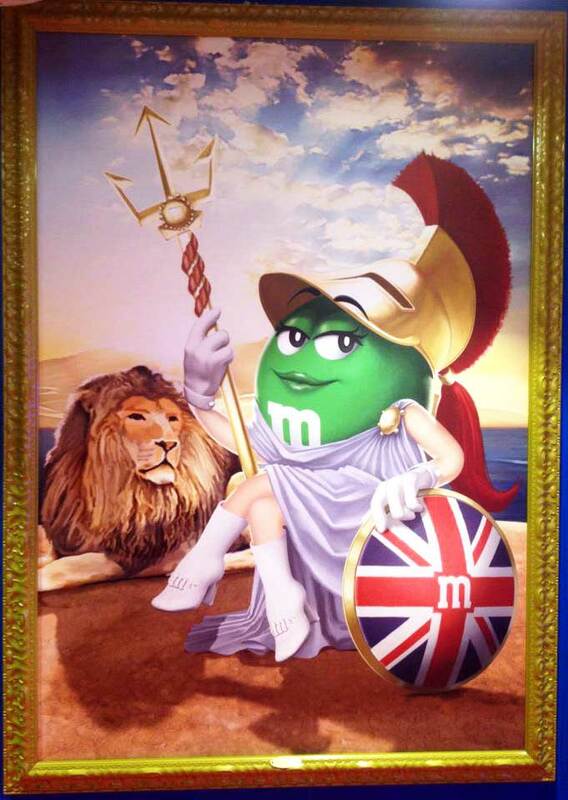 There was even a hall of fame where historical figures such as Henry VIII, Sir Francis Drake and Robin Hood adorned the walls in paintings as M&M’s figures. How does this relate to business you may well ask? Well, what about this. You know your business inside out – its strengths, its weaknesses. You can sell your products and services in your sleep! 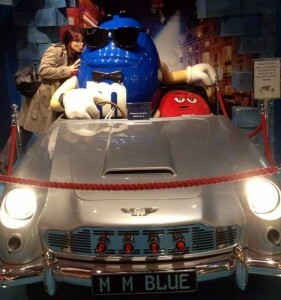 Tiger Ali cosies up to the coolest M&M in town. We’re not suggesting a store in the heart of England’s capital with giant figures, but there are plenty of things you can do on a much smaller scale to encourage interest in your brand. If you have a product offering, when was the last time you reviewed your product range? Have you asked your customers for their opinions on your products recently? Are there any products they’d like you to stock or any they’d like you to ditch? Start by listening to them and take action. Don’t second guess them. You might be surprised. Carrying out a customer survey doesn’t have to cost a fortune. Use Mailchimp to send out a very brief survey and offer a prize as an incentive. Inject a bit of fun into things and just like Disney, over time, you’ll generate enthusiasm for your brand. If you’re a service led business then really focus on your current offerings and employ the same tactics to gain insight from your customers and potential customers. When we work 24/7 in our own businesses there’s a real danger of developing blinkers when it comes to developing our products and services. We’re creatures of habit, meaning we can very easily churn out the same old things without moving our business forward and capitalising on new trends and demand from consumers. Finally… someone we can stand next to for a photo and feel slim! Tell stories. People love stories. M&M’s have achieved this beautifully in their store. In your marketing explain how a product was developed or a service created and give real life examples of where these have impacted positively on a customer. Show your business personality – the highs, the lows, the positive moves forward, the funny moments. And use social media channels to your advantage as a ‘voice’ for your brand. Post regularly and spend time getting to know your followers and fans and engaging in conversation with them. Remember, don’t preach, just observe and engage. It’s called SOCIAL media for a reason. These may feel like really simple steps – they are. But when was the last time you really took them? Take a leaf out of Disney’s book (or a few sweet tips from M&M’s World), sell the experience of working with you to customers and potential customers, make sure your colleagues live and breathe your brand and in return you could benefit from the M&M’s effect, attracting enthusiastic and loyal customers. Sweet eh? This entry was posted in business, marketing, social media and tagged PR Cambridge, PR Lincolnshire, PR Peterborough, PR Spalding, social media, Turquoise Tiger. Bookmark the permalink. One Response to Are you selling the experience? experience is everything …after that it is just stuff !